The rainy season has just started in my hometown. We had been concerned about the little rainfall for the past few months. That's why we are now relieved, while feeling sorry for the victims of eastern Japan. A vast area of eastern Japan has been suffering from the ground sinking after the quake and heavy rainfall would be painful for the victims. By the way, the general meeting of the Matsuyama-Freiburg association was held today and the clean-up of Freiburg Street was scheduled at first, but it was put off due to the heavy rain. The members got together at a coffee shop along the street and enjoyed chatting. As I heard various stories of trips to Europe, I got eager to travel abroad. I've really been worrying about the diplomacy of Japan recently. I wonder if the DPJ, the present ruling party of Japan, can make diplomatic efforts to resolve various issues between foreign countries. Russian high officials have repeatedly visited the northern territory of Japan to intensify their illegal occupation. South Korea is still occupying Takeshima island, which has been a traditional Japanese territory. China also still shows an interest in Senkaku Islands. Moreover the Japanese Government doesn't take any actual measures to expel them from Japanese territory. By the way, how about the U.S.? Though lots of Japanese feel friendly toward the U.S. looking at their aid for the affected people in eastern Japan, is the U.S. really called a friend of Japan? The US toy store, Toys'R'Us, came to my hometown years ago. My daughters were little at that time. That's why they were happy. However, some toy stores had to close their shops for that. In the last 10 years, most insurance companies in Japan were merged into U.S. companies. Japan Post Service was broken into three private companies and now the money of Japan is flowing out toward the U.S. These moves were from orders from the U.S. and this fact came to be known across Japan now. I'd like to add one thing; I'm not accusing the U.S. The U.S. Government is just pursuing the interests of Americans. It's natural. The Japanese Government is so stupid that the U.S. can do anything they want. Now, I have a few questions looking at the U.S. from another angle. How does the U.S. manage to change the rules of international society for its own convenience? What's the reason for it to force Muslims to adopt democracy? Is democracy the best system? Isn't it too arrogant? Anglo-Saxons aren't a majority in the world. I presume that the U.S. believes that its own culture and policy is the best in the world, but if the American people believe that, but they are helpless idiots. They should calm down and think carefully about the world's cultural heritage. How much do they have? The ruins of the native Americans, the Statue of Liberty, which was gifted from France, the imitation of the Palladian style building. In other words, they have nothing original which they can be proud of. I hope Japanese politicians would be proud of our own culture. To my regret, most of them are still brainwashed by the post-war policy of the U.S. and the Communist International. I wish Japan would be such a nation that could fight the evils of the world openly and squarely with the promise of a good conscience. Do not build homes below this point! I think there are numerous stone monuments in Japan, but nothing is more well-known than this monument in the picture now. It reads that homes built on higher ground would make you happy; don't forget the huge disaster by the tsunami and don't build homes below this point! Lots of households could have reportedly avoided damage by the tsunami following this ancient tradition. I admired the idea of the ancestors that built the monument at the highest reach of the tsunami. It would be our task to inform posterity of the calamity. Der Mai ist mein Lieblingsmonat. In Japan scheint dann oft die Sonne, viele Blumen und Bäume blühen. "Es lacht der Mai", fängt ein Gedicht Goethes an. Man möchte am liebsten nach draußen in den Garten gehen und mitlachen. One of my acquaintances held a personal exhibition and I visited it. He looked like being addicted to the beauty of the streets of European countries on his first visit. That's why he started to make miniatures of the German city of Rotenburg which was most impressive to him. Anyway, I admired his patience to build those miniatures by himself, no matter how strong an impression he had got. 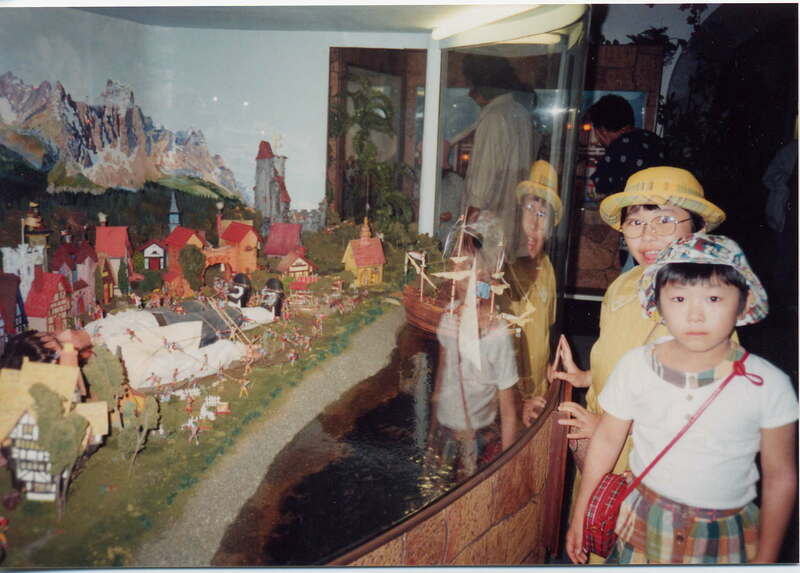 I recalled the joyous faces of my daughters in the miniature world in Victoria. If you are accessing from Rotenburg, please leave me a comment. I'll hand your message to him. I asked my parents to go on a short trip to a small island in the Seto Inland Sea. My parents have visited many places in the world, but don't know much about the islands near their hometown. I chose an island which they had never visited. Our ferry dropped in at an uninhabited islet on the way, and I recalled the role of this island before the Greater East Asian War. I'm writing about this tiny islet, Ohkunoshima island. You can find it in Wikipedia, but I'd like to revise the entry. Japan was a signatory on the 1925 Geneva Protocol banning the use of poison gas, but didn't ratify it. Additionally, it was also legal to develop and keep poisonous gas at that time. This island was the scene of the development of poisonous gas. This 4.3 km-around tiny island has now become a big tourist attraction with historic facilities concerned with the manufacturing of poisonous gas. We didn't get off the ferry today, but I felt like visiting this island some day. Do you know the brand name, Imabari, which is also the name of the city near my home town. Imabari City is well known as the city of towels and a number of citizens are involved in the production of the towels. Recently an incident made this city more popular as follows: when the towel companies tried to open their shops in China on a conjoined basis, the trademark of the Imabari brand was already registered in China. The towels under the false Imabari brand were naturally far from the genuine ones. Imabari City officially accused the false company of fraudulent use of their trademark, but China didn't listen. This incident was carved in the Japanese mind as one of the symbols of China. My family had a guest today and showed him the Towel Museum in Imabari City. Towels were actually being weaved in the museum and the visitors could see how the towels were made. In the exhibition hall, the Moomins were featured. There were lots of towels and I'll show you some of them. Do the Chinese know such beautiful artwork produced from a piece of cloth that you use for drying your skin.